I’ve long been a fan of James S.A. Corey’s The Expanse series, and I’ve really enjoyed how the Syfy Channel (And now Amazon) have adapted the books for television. The show has largely nailed how I imagined the look and feel of the world presented in the books, and I was particularly happy with how the Rocinante turned out. It looks pretty much how I’d imagine a small Martian Corvette-class gunship might look like. I recently reviewed the latest book in the series, Tiamat’s Wrath, and as with the rest of my book reviews, I’ve taken a picture of the physical book. 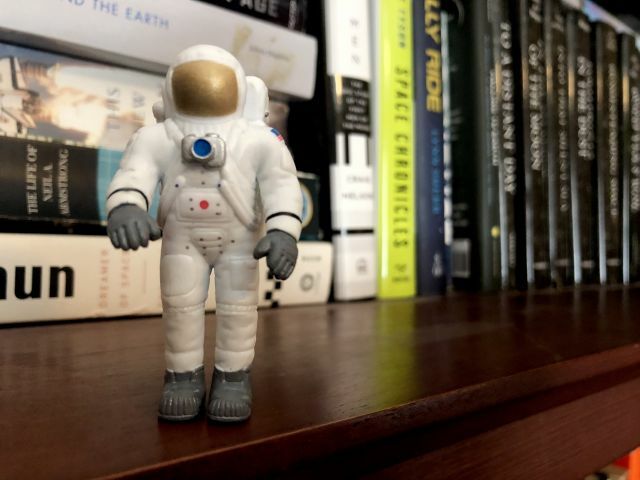 I typically will throw in some sort of little knickknack that relates to the theme or subject of the book (like with my reviews for Big Damn Hero, Red Moon, or Solo). I actually used my 3D-printed model of the Rocinante for my review of Persepolis Rising back in 2017, but the angle didn’t really come out as well as I’d liked. I got the model a couple of years ago when the Syfy Channel released a series of models from the series on Thingiverse, and someone went and posted some files for the guns. For that original review, I planned on painting it up to look like the MCRN Tachi, painting it up in black and then bright orange. That didn’t come out nearly as well as I’d liked — the orange paint I used wasn’t model paint, and it didn’t go on evenly. For the new review, I wanted to reuse the model, and figured it was time to redo the paint job. I opted to turn it into the Roci, and painted over the entire thing with a couple of coats of gray automotive primer, which was about the right color. The paint cracked a little (too impatient), but between that, the extra sanding, and some of the scratches, it gave the surface a bit more of a worn, damaged/patched look. I then went to the local model store and picked up some dark orange paint and a couple of fine brushes. Once the primer had completely dried, I hand-sketched on the bigger details with a pencil, and then applied the orange paint, then white. After that, I mixed up some black acrylic and watered it down, and then painted and wiped it off to give it a weathered look — kind of what I did with my Shoretrooper a couple of years ago. This was the first time I’d ever actually painted a model, so the details are… rough, and a more experienced painter would do a much better job, I’m certain. I’m not actually sure it’s a hobby for me (although damned if I’m not getting Fantasy Flight’s Shoretrooper expansion when it’s out later this year), but it was fun to try out. I’m particularly happy with the pinup on the side, which I roughly painted on. It’s good from a distance, and it’ll hang out on the shelves in my office for now. I’m back in Vermont after a couple of days of travel to and from Chicago for Star Wars Celebration. I haven’t been since 2005’s Celebration III in Indianapolis, and it was an outstanding time. Since i joined The Verge in 2016, I’ve gone to a bunch of big conventions — San Diego Comic Con and New York Comic-Con, both of which were a lot of fun, but extremely busy. We didn’t send anyone this year, but I’ve been wanting to go, so I took time off to attend on my own to work on a project that I’ve been working on, and I’ve just been wanting to go, you know, as a fan. The last couple of Celebrations have found me sulking at home, watching pictures of the fun on Facebook. 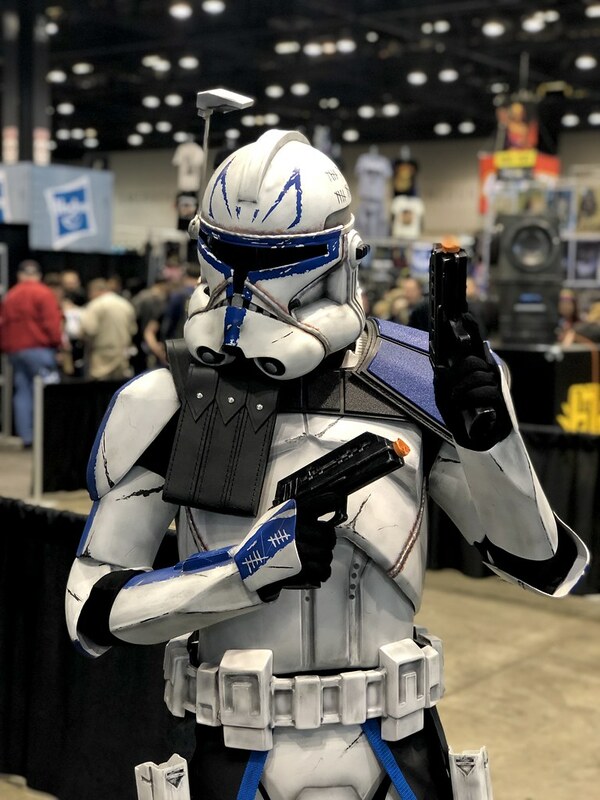 Because I wasn’t working for this con, I was able to bring along my Shoretrooper. I ended up buying a new case for it (one of these — I’m kicking myself for not buying one earlier) to transport my armor, and got on the train in Albany, and got in Friday morning. There were a bunch of panels that I thought about getting in line for, but ended up skipping everything in favor of just floating around taking pictures of cosplayers and conducting a bunch of interviews. That ended up being a huge highlight. Big conventions like this bring out a ton of costumers and cosplayers, and just about everyone I asked was eager to pose for a quick portrait. I took a bunch on my regular camera, but I ended up taking most with my iPhone’s portrait mode, which worked out nicely. You can see the images I took in an album here. I’ve got some more that I need to process and upload. Of course, I saw the trailer, standing in the middle of the exhibition hall with a ton of people. It looks fantastic. Palpatine’s laugh at the end had everyone screaming in the room, but what was really something was seeing Ian McDiarmid coming out on stage: “Roll it again.” My friend Bryan Bishop made a good observation on Twitter: that Palpatine has been the antagonist from the beginning of the franchise, and it seems appropriate that he’ll be there at the end, in one form or another. Plus, Lando back on the Falcon! Leia and Rey! Remnants of the Death Star! I’m excited for it. The only other thing I was able to really check out was the Vader Immortal VR game coming out for Oculus Rift. That was something — I haven’t really used a VR headset before, and playing with a lightsaber was quite a bit of fun in that format. I don’t know that it’s something that I’d buy, but it was quite a bit of fun to experience. The most fun that I had was hanging out with other Shoretroopers. I spent Friday looking for them, but only caught glimpses of one or two, but on Saturday, I came across a group, took a couple of pictures, then ran up to my room to suit up. It took me 20-30 minutes to find the group. We then wandered around for a while, posting for pictures. 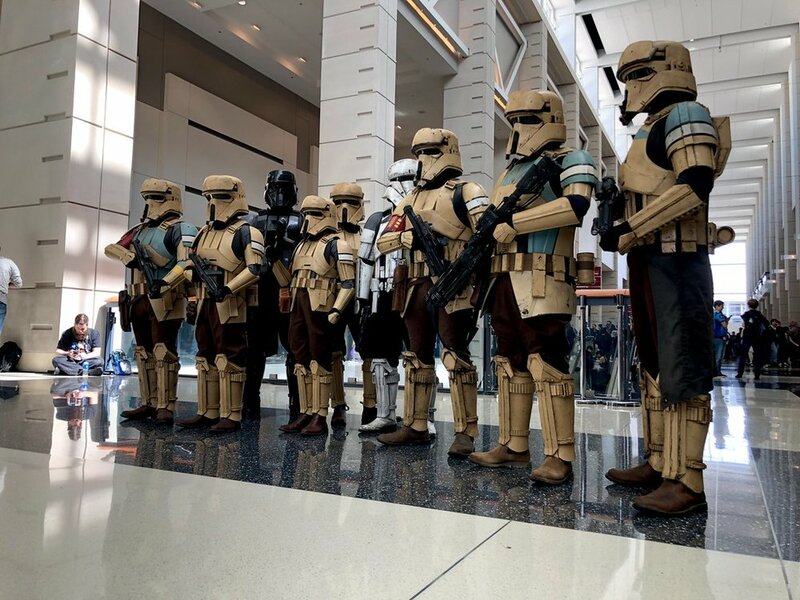 I found myself in another group on Sunday after the big 501st Legion picture. We ended up at a big prop — a TX-225 tank — and posed for pictures with people there. I didn’t have my gun with me, and ended up on top, where I directed people to imagine that they were firing down range at rebels. The tiny bit of immersion was fun to play with. I de-suited for lunch, then returned a couple of hours later to take part in a larger Rogue One picture, which had a bunch of characters from that film, which was a lot of fun. (Still haven’t seen pictures of that floating around, weirdly). And then, it was over. I got back on the train to Albany, rewatched Rogue One on the ride back, met up with Megan and Bram at a resort for the next day, then returned to Albany to pick up a couple of friends who had their flight canceled from under them. This was a lot of fun, and I’m kind of meh today — post-con blues are a thing, y’all. What I loved about this show was just how positive things were. Everyone was thrilled to be there. Celebration is a good name for it — people are sharing in this collective obsession, and it was fun to be part of all of that. I’m already thinking about going to Celebration 2020 in Anaheim, California. There’s a tweet going around about the games that are your personal top 10 video games of all time. It’s been fun to think about, especially as I’ve never really been a huge gamer. But looking back, there have been a bunch of games that have been a huge influence on how I’ve thought about stories and speculative fiction over the years. Here’s my personal top-10 list. I really wanted to like the original Titanfall, but I really don’t like online games. It’s just not an experience I enjoy. But Titanfall 2 was fantastic. I love the story, love the gameplay mechanics, and I REALLY love the fantastic mechs. I’m bummed that there doesn’t appear to be a third game on the horizon. This feels like a world that could really challenge Halo, and I’d love to see more of this world. When I bought my Nintendo Switch, I quickly bought Mario Kart on Megan’s advice. It quickly became a good game that we could all play as a family, and something that we could cart along on family trips for when we had downtime or something. I also picked up Super Mario Odyssey, which we’ve also played quite a bit. I haven’t beaten this game, but I’ve had a lot of fun watching Megan and Bram play it. When I worked at Camp Abnaki, there was one year where we had a shared computer in the equipment room. It was an easy assignment that left a lot of time for playing, (or playing after hours), and I spent a lot of hours at Camp, and later, when I got my own computer, playing through this. I’m not sure that I ever actually beat the game, but I did have a lot of fun leveling up my character. Who doesn’t love Sim City? I love building epic cities in this, and all the fiddly bits that it requires, from raising / lowering taxes to playing with crime rates, roads, and zoning. I’ve played a bunch of mobile apps, but none of them really compare to this one. When I got my first computer, one of the games I got hooked on in high school / college was Age of Empires. That shouldn’t be a surprise — I studied history, and loved this take on it, building up civilizations and destroying my neighbors. I haven’t been able to play it for years, but I’ve been thinking of taking out my old computer to give it a spin. My friend Laura Hudson’s game list reminded me of this one, and it brought back a flood of memories. I’m pretty sure that this game came with our first Compaq computer in the mid-1990s, and I spent hours and hours exploring the Green Isles and reveling in its mashup of mythologies and fairy tales. I recently went and watched a play-through on YouTube, and was struck at how funny and clever it is. This was a hard one — it took me forever to finish it. I missed the boat on Pokémon when I was a youth. Kids at summer camp played it, but I thought it was kind of dumb — I only played serious games like Dungeons & Dragons (where we accidentally exploded a moose). But when Bram got into the franchise via friends at daycare and school, I started playing the game with him, and it’s been a good motivation to get out and walk around quite a bit more. This was probably the first video game that I ever really played, aside from the occasional visit to friends’ houses. My parents bought me a Game Boy, and it came with Zelda. It took me an embarrassingly long time to beat it, but I loved the game, and cried when I finally finished it. I went and replayed it just before Breath of the Wild came out, and it holds up nicely. I’d wanted to see a BOTW-style remake, but I’ll certainly be playing the 3D remake that’s coming later this year. Halo was the first time I really got into gaming. It came out when I was a summer camp counselor at Camp Abnaki, and every summer for years, I played with my friends while we had downtime. I love military science fiction, so the power armor and FPS thing works for me, but the controls and gameplay were intuitive, the design was great, and it’s a neat story in a much larger narrative. I’ve since really gone on to love Halo: ODST for its story, as well as Halo: Reach for enriching the backstory. I’m a bit more lukewarm on Halo 3, but I do really enjoy Halo 4, especially its guns. Halo 2 and 5 are a hot mess, though. I can’t begin to imagine just how many hours I’ve spent playing this game. Not just in beating the main story, but just wandering around and exploring. 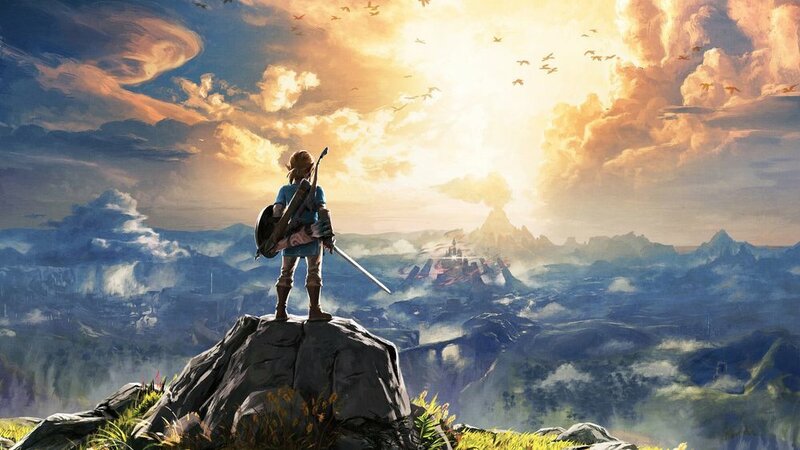 This is a game that rewards curiosity, and walking, running, and riding across this fantastic version of Hyrule never feels like wasted time. I played this a lot with Bram, who watched and helped me with the puzzles and shrines, an experience that I’ll treasure forever. On top of that, the design and artwork is stunning, the gameplay is incredibly good, and the shrines and quests are wonderful. I got word last week: UVM’s Tolkien in Vermont conference has accepted my proposal for a presentation for its upcoming, 16th annual conference, Tolkien and Horror. The conference is a neat, two-day event that the university’s English department hosts. 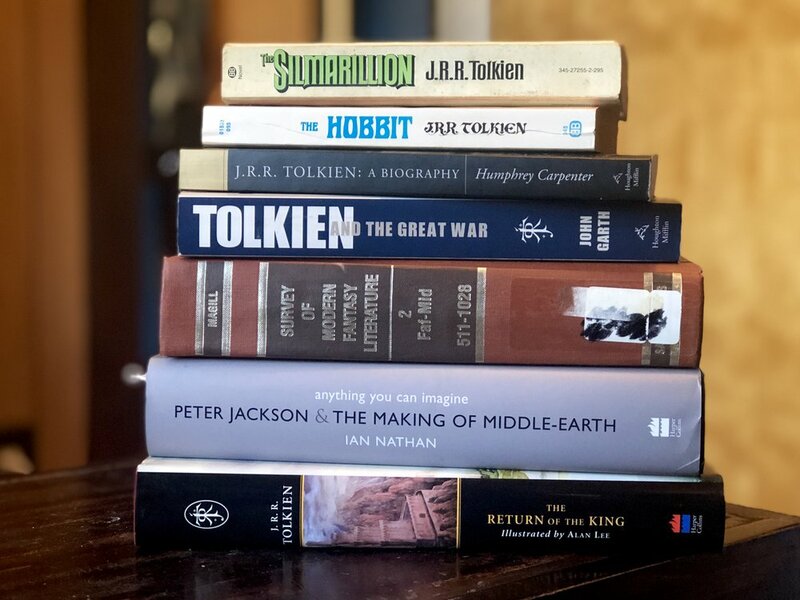 In line with this year’s topic, I’ll be talking about the impact of Tolkien’s experiences during the First World war had on him, and his fiction. Tolkien, of course, participated in the conflict, and it left him profoundly shaken. I’ve presented at this a couple of times already — in 2014 and 2015, mainly about Tolkien’s impact on fantasy. I also spoke at Norwich University’s Sullivan Library back in 2016 on a related topic, although this year’s paper will delve a bit more into wartime imagery worked its way into Tolkien’s Middle-earth — think Frodo, Sam, and Gollum’s trek over the Dead Marshes in The Two Towers, where they encounter the dead from an ancient battle. This year’s conference will take place on April 5th and 6th (my talk will be on the 6th, although I’m not sure what time, exactly) at UVM in Burlington. It’s open to the public — tickets are $25 ($15 if you’re from Vermont, and free for UVM students), and the last couple of times that I’ve gone, it’s been a delightful, enlightening afternoon. If you can’t make it, i’ll probably include my presentation in my newsletter. I’ve got a new prop-building project that I’m embarking on: a TST-ChemRail rifle from Neill Blomkamp’s 2013 film Elysium. I’m a big fan of the film — it’s one of my favorites out there, with a solid story, fantastic worldbuilding, and messaging. Not everyone agrees, but it’s one that I’ll stand by. One of the things that have always impressed me with Blomkamp’s films is the design of the world, and Elysium’s far-flung future is loaded with military gear and tech. In particular, I’ve always really liked the ChemRail gun that’s used at a pivotal point in the film — Max grabs it when he’s onboard the station, and uses it as he works his way to the control center. It’s a futuristic weapon, but one that’s functional and realistic-looking device that isn’t cartoon-y, like so many science fiction weapons can be. 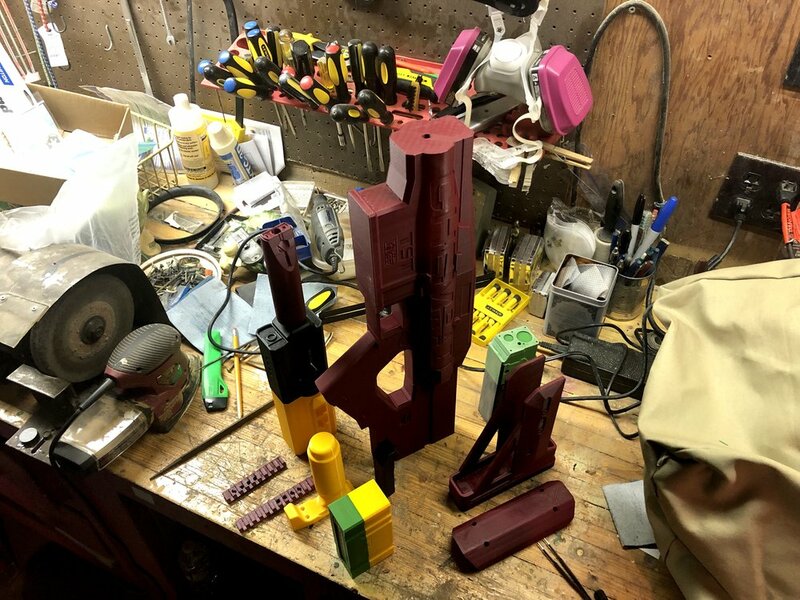 Last fall, the Replica Props Forum posted up a couple of pictures on Twitter from one of their member-builders: a ChemRail gun that they had designed based on reference images and sold as a 3D-printed kit. I ended up splurging on it at the end of the year, figuring it would make for a good build project. It just arrived earlier today, and I’m really impressed with the quality and detail. The print is extremely clean (ANY seller who cleans up their 3D prints before shipping is appreciated) and finer details like logos and functional pieces are printed right into the design. It isn’t an exact match — I spotted some tiny things that differ, but they’re unnoticeable if you don’t know what you’re looking for. The printed blocks are also finely-printed, which means that they won’t need a whole lot of cleanup anyway — a bit of sanding, then glue, a couple of coats of primer, paint, and then weathering. It’s kind of goofy-looking now, because the printer just threw whatever filament they had on hand to get it finished. So, step one will be to sand down the entire thing. I did a little with a piece of fine sandpaper to start over lunch, and it works nicely. Fortunately, the original prop models were also 3D printed, and they have some of the print lines remaining, so I don’t actually have to make this super-smooth. The only thing I really need to get for this is a thin dowel to go through the middle, which will provide it with a bit of a spine when everything is glued together. Once it’s done, it’ll go… somewhere. I’ll probably find a way to mount it on the wall in my office. I’m not a huge fan of real guns, but I’ve always thought it would be cool to have an armory of weapons from science fiction and fantasy films at some point. Mike Glyer at File 770 recently interviewed me about the online anthology that I’ve been working on, Better Worlds. Mike asked some good questions about the balance between science and technology, the larger impact of the project, and some advice for aspiring writers. MG: What’s your advice for aspiring science fiction authors? ANDREW LIPTAK: There’s a lot of advice out there that’s good — read a lot, write a lot, and read what you’ve written out loud, and so forth. Something I’ve been thinking about a lot lately is how incredibly valuable it is to break out of your shell / community / circle of writers / group to discover new ideas and viewpoints. I recently moderated a panel on the implications of artificial intelligence at the United States Military Academy at West Point, and I came out of that three-day experience with a notepad full of ideas for potential stories, based on what I’d seen and heard. In other, related Better Worlds news, we’ve released a couple of other stories since I first updated about the project back in January. We’ve got ‘Online Reunion’ by Leigh Alexander, ‘A Model Dog’ by John Scalzi, ‘Monsters Come Howling in Their Season’ by Cadwell Turnbull, ‘St. Juju‘ by Rivers Solomon, ‘The Burn’ by Peter Tieryas, ‘A Sun Will Always Sing’ by Karin Lowachee, and ‘Skin City’ by Kelly Robson. We’ve got three more stories coming up — ‘Move The World’ by Carla Speed McNeil (coming Friday), ‘Overlay’ by Elizabeth Bonesteel (coming Monday), and ‘Machine of Loving Grace’ by Katherine Cross (coming Wednesday). The project has been a bear, and it’s great to finally see the stories up online. Of the entire group, I think my favorite stories are the ones by ‘Monsters Come Howling in Their Season’, ‘A Sun Will Always Sing’, and ‘A Theory of Flight’, but that’s not to say that I don’t really like everything else on this table of contents. The art is superb — all credit there goes to William Joel, our Art Director for the project, and I’ve really enjoyed the videos — especially ‘A Theory of Flight’ and ‘A Sun Will Always Sing.’ The video for ‘Overlay’ is also quite good — you’ll see that next week. I’m also a big fan of the audio adaptations, which feature full casts and sound effects, which really puts them a leg up and above other fiction podcasts that I’ve heard. I’m biased, of course, but the general feedback that I’ve seen in online comments on the videos and on Twitter / Facebook have been almost uniformly positive. I’m constantly on the hunt for new music to listen to, and in the past week, I’ve added a couple of new songs to what I call my “.Best New” playlist. It’s a playlist (the . at the beginning ensures that it’s at the top of my playlist column in iTunes) that I basically dump any new song I come across that I’ve been enjoying, and keep it around until I’ve heard it enough. First up is a new song from Josh Ritter, “Old Black Magic”. He just announced a new album called Fever Breaks, which is due out in April of this year. Ritter is one of those artists that will pretty much get me to drop anything and preorder. I’ve been a fan of his for over a decade now, and I’ve seen him a bunch of times in concert — he always puts on a great show. This song is a good one of his, and it really highlights some of the progression I’ve seen him go through as an artist — he has a great Americana sound, going from melodic to folksy, to rock. This one’s definitely more on the rock end of the spectrum, and I really love the beat and drive that this one has. It really has me eagerly anticipating Fever Breaks. The Mountain Goats are another band that I’ve been a fan of over the years, although I haven’t listened to them as closely as I have with Josh Ritter. I’ve always appreciated the nerdiness of The Mountain Goats, who have released songs about H.P. Lovecraft (“Lovecraft in Brooklyn”), vampires (“Damn these Vampires”) and some others. I interviewed their lead singer, John Darnielle, and we had a good conversation about American gothic literature. Sadly, the audio didn’t work out, and I’ve never published it. Their next album looks like it’s going to be their nerdiest one yet: it’s a collaboration with Dungeons & Dragons called In League with Dragons. Darnielle described the album as “Dragon noir,” which sounds utterly perfect. Also instantly preordered. The final song is one from an album I’ve already preordered: Extra-Ordinary by Lost Leaders, who I discovered last fall while traveling to Toronto. This is the song that they teased on their campaign video for their upcoming album, Promises Promises, which is due out next month. I really love their sound, and this one really popped for me — the chorus is really great, and I’ve been listening to it non-stop for a week or so now. I just published a big feature on The Verge: “How a Vermont became a model for online communities.” It’s a piece that’s been in the works for more than a year now, about a social network here in Vermont called Front Porch Forum. The piece started back in the fall of 2017 — I made an offhand comment about it during a story meeting, which peaked our Editor in Chief, Nilay Patel’s interest. FPF is a network of forums that exists here in Vermont — each town gets a forum (for the most part), where they can post messages to. Most people use it for things like asking for recommendations (I’ve gotten reliable names for plumbers and carpenters through it), for highlighting lost pets, or in more extreme instances, helping with disaster recovery, as what happened in 2011 when Irene devastated the state. It was particularly helpful in my hometown of Moretown. 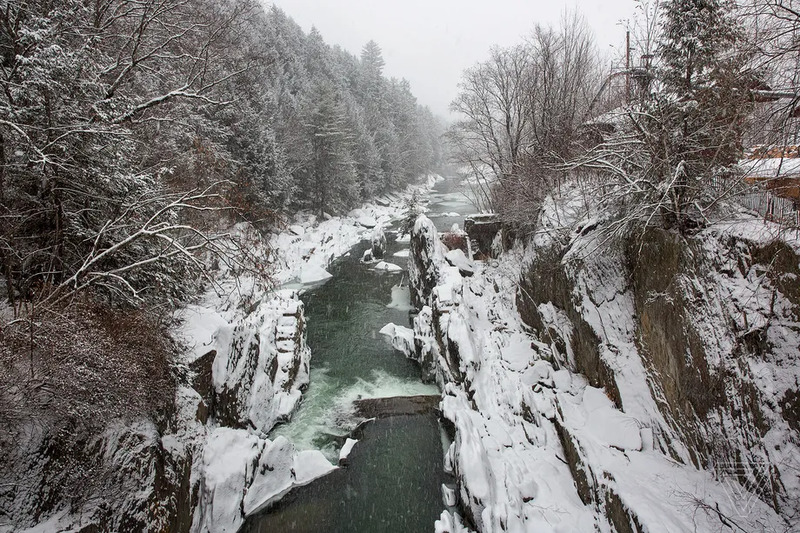 I began work on the article, and our staff photographer, Amelia Krales came by to take pictures of various locations in Vermont — Moretown, Westford, and Burlington. Her pictures are fantastic, and worth clicking on the story in and of themselves. Between my other responsibilities at work, this was a slow-burning piece. That worked a bit in our favor, because last year was when social media had a pretty bad year — Facebook was engulfed in a bunch of scandals, while Twitter had its own issues. What makes FPF stand out, I think, is that it’s pushing social connections down to a local level, rather than a global one — and, they police their content, and are pretty proactive about booting people who are being abusive. It’s a complete coincidence that it came out today, just after Cadwell Turnbull’s short story, Monsters Come Howling in Their Season, went up on the site, which deals very much with some similar (fictional) issues. A lot of people helped with this: Josh Dzierza and Casey Newton edited, our features editor Kevin Nguyen took a pass. Adia Watts copyedited all 4000+ words, and Amelia took the fantastic pictures. I’m really happy with how it turned out, and I think it’s one of the better things I’ve written for the site. Better Worlds: A Theory of Flight: Now Live! Our science fiction anthology Better Worlds is now live, starting with the first story, Justina Ireland’s “A Theory of Flight”! This is a really outstanding short story about open-sourced rockets, racial justice, and revolution. Give it a read (and watch the fantastic short film that accompanies it!” Then go and read the Q&A with Ireland. 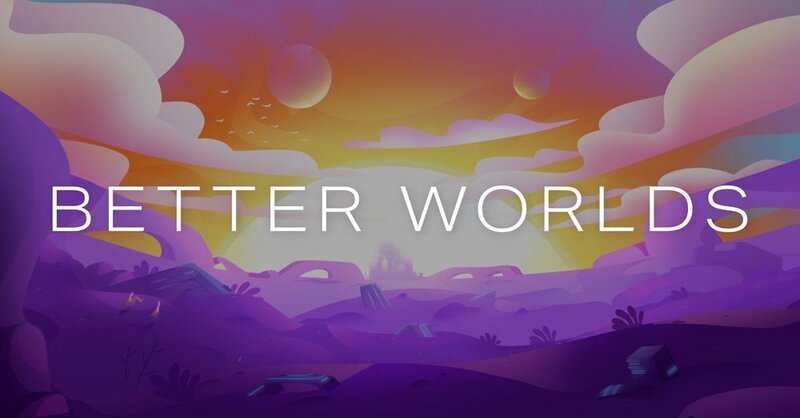 Better Worlds: Coming next week! Back in December, i mentioned that The Verge was launching a science fiction anthology, Better Worlds, which is chock-full of optimistic science fiction stories. The first stories are launching next week! The first drops on Monday and is “A Theory of Flight” by Justina Ireland, which will come with a really amazing animated video. The second is “Online Reunion” by Leigh Alexander, which comes out on Wednesday. This one will come with an audio adaptation. Both will come with accompanying Q&As. In December, I put out a call for recommendations for standalone science fiction novels — in part to assemble a list for The Verge — but also because I was looking for something along those lines. I got a bunch of recommendations, but one that stood out was Adrian Tchaikovsky’s 2015 book, Children of Time. A friend of mine had already highly recommended the book, so I picked it up, and when we did a bit of traveling over the holidays, we listened to the audiobook. It’s a magnificent, epic story, and it’s well worth reading if you’re in the mood for book that deals with big ideas. The story begins in the distant future. Humanity has begun to spread to the stars, and has enacted a variety of terraforming projects on several planets. Dr. Avrana Kern is the researcher overseeing the final efforts on a planet that she’s called “Kern’s World,” which has been made habitable for human life. She’s also about to kick off an experiment — two cargo capsules are to be dropped to the planet’s surface: one carrying a monkeys, the other a nanovirus that’s designed to uplift said monkeys in a handful of generations. It’s a grand experiment on evolution, and it goes drastically wrong when a crew member sabotages the mission, sending the monkeys to their doom. At the same time, a war breaks out on Earth, destroying space habitats and wrecking the planet’s surface. Kerns barely escapes, driven by the desire to oversee any hope that her experiment might work out. That’s just the prologue. The story then jumps ahead. Remember those monkeys that were supposed to get uplifted? They burned up in the atmosphere, and the nanovirus jumped to another creature: a jumping spider. Tchaikovsky introduces a spider named Portia who has an uncanny realization while she’s hunting a larger spider — she can get help from others like her, and by working together, they’re able to get a tiny evolutionary foothold. Tchaikovsky then jumps to another perspective: the crew of a human starship called the Gilgamesh, and a “classicalist” named Holsten Mason. Humanity, as it turns out, wasn’t wiped out completely in that war, but it was set back, with a new civilization blossoming on Earth during an ice age, only to realize that when the ice recedes, they’re going to be left with an uninhabitable rock. The survivors cobble together a generation ship, and set out into the depths of space, trying to find a new home. Mason is awoken a thousand years into the voyage, when they come across a beacon — Kern’s signal over her planet. The novel alternates perspectives, first with a new generation of spiders, and then the crew of the Gilgamesh as they try and find a suitable place to set down. By shifting perspectives, Tchaikovsky shows off two things: the rise of the spiders, who are quickly evolving a sophisticated society as they overcome their neighbors, and figure out how to survive and thrive by coopting the skills and directing the evolution of other creatures, like ants and beetles. On the other hand, we see the downfall of the humans, who quickly devolve to an almost feudal society aboard the ship. They’re turned away by Kerns when they reach her world, and are directed to another, only to find that it’s unsuitable, and are forced to turn back in order to safe civilization. Gerry Canavan (the scholar who spoke highly of the book) mentioned somewhere that he was reminded of Cixin Liu’s Three-Body Problem, and there are a lot of parallels between the two works. They’re both huge, epic stories of evolution and the rise and fall of civilizations, much in the mold of authors like Isaac Asimov, Arthur C. Clarke, or Frederik Pohl. Tchaikovsky builds on this trope by exploring a wide range of topics that complicate any civilization — gender roles (the spiders form a matriarchal society), and he flips arguments about sexism and culture nicely. The juxtaposition between humans and spiders also plays out a larger story about how a culture is composed. Over the centuries, Kerns is deeply concerned with what she sees as failures of humanity: that they’re prone to warfare and balkanization, arguably poor footing and habits to extend out into space. We see that play out on the Gilgamesh as well — the ship’s captain becomes obsessed with his assigned task to shepherd humanity to safety, which causes its own problems as he works to keep the ship going, and as new generations of people appear over the millennia. By the end, the two cultures will have a pretty epic clash, and those differences force a resolution between the two. The book has shot to the top of my hypothetical “favorites” list. Canavan compared the books to Three-Body Problem, and i’ll toss in another comparison: The Expanse. One of the things that’s attracted me to James S.A. Corey’s series is its focus on humanity’s tribalism and how we’ll likely bring some of our inherent issues with us if and when we begin to establish a foothold in space. Tchaikovsky doesn’t specifically look at racism in the same way that Corey does, but there’s a number of parallels that ultimately stack up to “humanity has the capability to improve itself, and it should.” Children of Time really makes a good argument that propagating out into space means that there are major issues that need to be addressed if humanity wants to survive long into the future — not necessarily in the depths of space, but here at home, too.